Fools! You thought it was a clear joke. It requires Sid Meier's Civilization: the Boardgame, or at least, some placeholder of its miniatures. 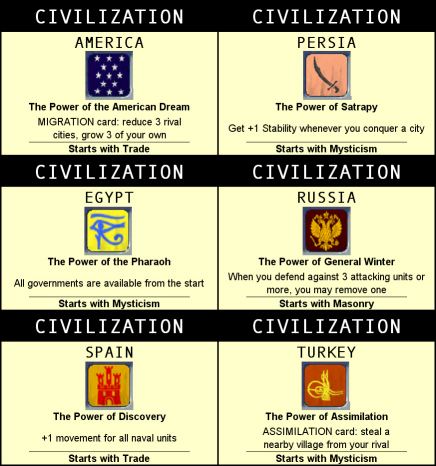 What is "Civilization IV: the Board game" exactly? Cool! I own the boardgame but we never played a game to the end because the game mechanism just doesn't work. have any of you played the old Avalon Hill civ boardgame? That was the best! DUDE THIS IS SO COOL. we have that boardgame at the homies house!!! The rules are too small. I can't see them. what are you doing on the 25th of May at 1500 EST?? Very very nice. Got the board game awhile back but completely flawed gameplay. Thank you for all that you have done to make my CIV a lot more fun. And anything that makes my civilization board game playable makes me very happy. I understand that your rules are still in beta, but I have some questions that I haven't figured out in my testing of the game. 1. in 01-rules100.jpg Actions is listed as the 4. in sequence. There seems to be no clarification anywhere on this process. I.E. what are the action cards for? Can more than one player use taxation (or any other card) for example? Does a card like Americas unique action require three cities be used? or can they reduce one city and grow one. What if there are not three cities? Is Americas ability supposed to be used more than once? With the wonders is the great wall defensive bonus always used or just defending inside the city with The Great Wall? Does the free taxation caused by The Leaning Tower still cause your stability level to drop? Thank you for any response you might find time in you busy schedule to compose. Thanks for your intererest. I will integrate your question to the ingame text, to make everything clear. Thank you for taking the time to respond to my inquiry. We played our first test game last night. Our play test team included two 18 year old girls one 26 male one 25 male and one 23 female. Only the players over the age of 20 have played Civilization in any manor. Action: There is only one page in the ,jpg files that contain action for every player that would require that page printed five times. Not that big of a deal except that that page also contains the wonders and palace tokens. Maybe a sheet could be made to include two sets of action cards so you could print the page twice to make room for five players instead of printing four more pages to make cards. Then again, the biggest observation made by the group was that the cards were not used so much as the sheet explaining what each action did, was passed from player to player. If possible 5 reference sheets would do do better than 25 cards. The cards for each civilization are great. It is the testing of this group that America's power is so amazing that these changes be made to it. Fist single use. Let America pick any three cities even over different enemies and grow three cities. Not just from the same enemy. Maybe that was always the intention but it does not come across that way in readings. Making it six players: Barbarians don't have to be gray they can just be unescorted. Troops on the board without flags are barbarians. If they are from a minor civilization token just leave that token on the board. If they are from a revolt check turn the city upside down. Or save minor civilization tokens and put one in in the cities place. No reason not to make it six. Technology: First there was a misprint with industrialization, all the cards said improve a village not just the first. But it was in green so we assumed it only applied to the first. Second there is an oracle code of laws jump. Greece in the first turn of the game can use it's Academy Card research Calendar, Astronomy, use the free technology from discovering Astronomy to research Nationalism. Do we really want a tech tree that can allow for Machine Gunners to be researched (not built) by turn two? If the tech tree requires both prerequisites to be researched than computers should be given some secondary use as there will only be four technologies left when they are reserched. They probably should any way so more than one person will research them.Maybe change the text for Computers to When researched get all techs from players who do not have computers. That way first still gets the best bonus but his technology are safe from number two. sorry for my poor english, but what does it mean? If possible 5 reference sheets would do do better than 25 cards. it's up to you to print as many reference sheets as you wish! It is the testing of this group that America's power is so amazing that these changes be made to it. OK. I suspect that it is overpowered only with many players, as in 2 or 3 it wasn't. Prerequisites are AND gates, like in Civ1,2 and 3. The Greek trick doesn't work. No reason not to make it six. -> did the newbies like it? -> did you, compared to the original like it, and find it simpler?